We went to North Carolina in September and I’ve been meaning to post this review ever since. We flew into Charlotte and our first priority was lunch. I googled “eating vegan in Charlotte” and Luna’s Living Kitchen came right up. Only 15 minutes from the airport, we headed over and enjoyed a fantastic lunch. The restaurant has a great open atmosphere. It has a sort of industrial space vibe, with high ceilings, brick walls, and big windows. 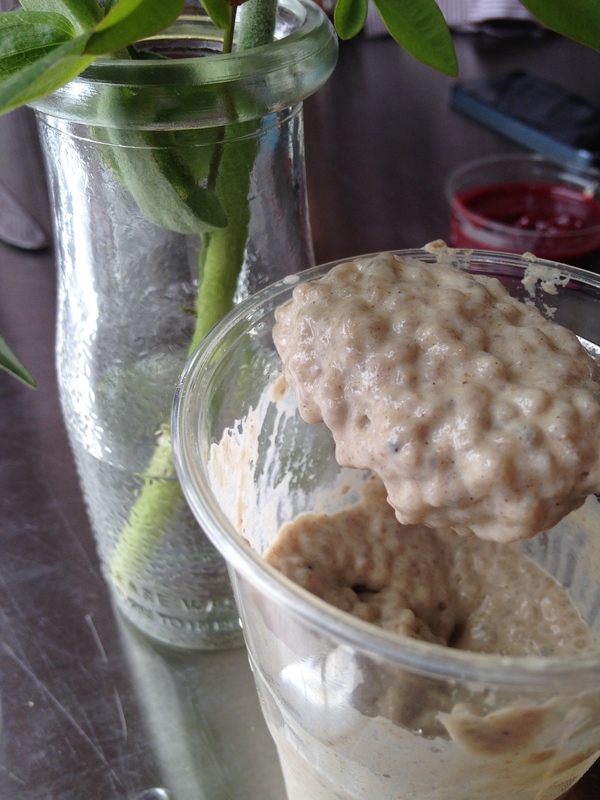 For an appetizer, we took this chia seed pudding out of the to-go refrigerator because we were starving. It was creamy and delicious and very cinnamon-y which would normally bother me but I actually liked it. It came with a little raspberry sauce on the side. We couldn’t order everything on the menu (I wish!) but we tried several amazing dishes. First, this arugula salad which came with with avocado, pears, candied walnuts and cranberries and a scoop of homemade cashew-basil cheese. Then we tried the Lunasagna, layers of mushrooms and zucchini with sun dried tomato sauce and the cashew-basil cheese. It was good but I have to say that I am over raw lasagna. Remind me not to order it anywhere again. It is too filling. And check out this quinoa-kamut veggie burger on multigrain bread! This one was called Fire and Brimstone because it was spiced with chipotle sunflower hummus, onions, cucumber, salsa verde and house hot sauce. Phenomenal. I also had to try the zucchini bolognese which was made with walnuts. Loved this version of “noodles” and sauce. Very tasty. And on the side, this gorgeous beet and carrot salad. Light and refreshing. We also got a great broccoli Waldorf salad but sadly I didn’t get a shot of it. It had walnuts and cranberries. Or maybe raisins. The little side salad on the Lunasagna plate was tossed with this amazing dressing which I am so going to make myself. And of course, dessert. A raw chocolate cake. Yum! For the road, we grabbed a couple of bottles: Luna’s almond milk which was made with coconut nectar, almonds, water, vanilla, and salt and the Pura Vida juice which was carrot, apple, orange and lemon. We left totally full and totally satisfied, but wanting more! Luckily, we went back for brunch on our way home a few days later. We all ordered this psychotic “Biblical Breakfast” which was 3 warm slices of freshly baked cranberry-walnut bread topped with organic peanut butter, almond butter, and coconut butter. Then they added a layer of fig preserves. Then they topped it with bananas, maple syrup and a sprinkle of white chia seeds. Holy heaven! We also got the El Luchador smoothie which was made with hemp milk, banana, peanuts, raw cacao and agave. Delicious! If you are in Charlotte, you have to go to Luna’s!